The Guided Tours are conducted by USFS Coweeta Hydrologic Laboratory scientists and staff for various user groups. 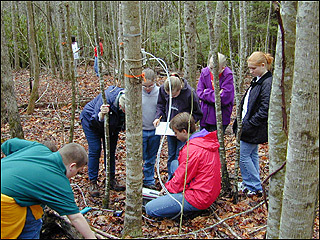 These groups include primary, secondary, and college education classes, visiting regional to international scientists, forest and watershed managers, and other user groups. These guided tours have been facilitated by the completion of the Coweeta Conference Center where groups gather, tour materials are distributed, and participants receive introductions to the research projects and sites that they will visit. The USDA Forest Service Seminars and Workshops provide current and time-tested research to scientists, natural resource managers, and policy makers. They supply the latest in rigorously tested scientific information and technology, as well as an effect atmosphere for knowledge delivery using the facilities and land base unique to the Coweeta Hydrologic Laboratory site. These seminars and workshops also aim to increase collaborative efforts between researchers, managers, and cooperators in order to establish "common ground". They work to facilitate the gathering of future research needs and opportunities to ensure that research is relevant and responsive to the needs of natural resource managers. Many of the materials used to support our tours are available in the Coweeta LTER Resource Catalog.